One of the new wave of Scottish farm distilleries designed by the late Jim Swan, which is set up to produce a light, fruity and organic single malt spirit. 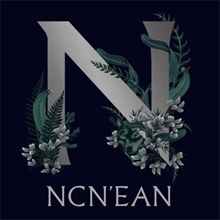 Ncn’ean (pronounced Nook-knee-anne), is an abbreviation of Neachneohain, the name of a witch-queen in Scots Gaelic folklore who, according to Sir Walter Scott, ‘rode on the storm and marshalled the rambling host of wanderers under her grim banner’. 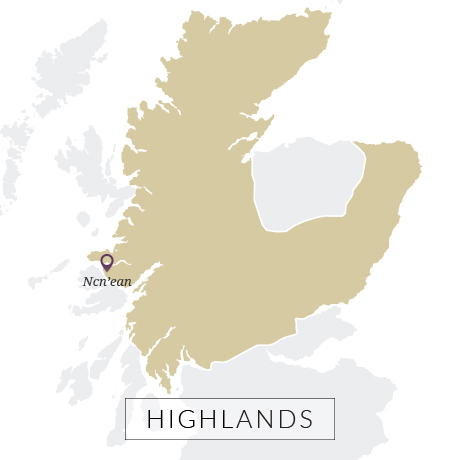 Much like its namesake, Ncn’ean distillery on Scotland’s Morvern peninsula, is very much a leader in its protection of its natural environment, and intentions to operate at the forefront of innovation. 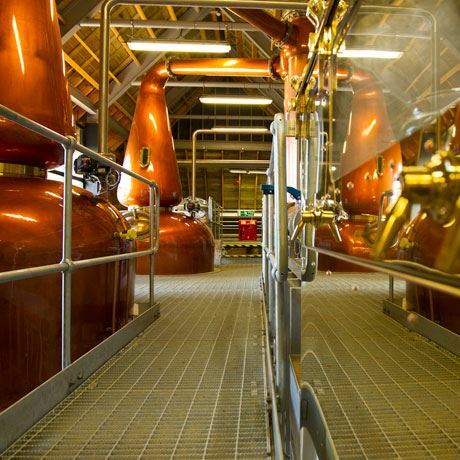 Ncn’ean has been designed as the first fully organic modern distillery in Scotland powered by 100% renewable energy. Wood chips for the biomass boiler are sourced from a local forest, while all by-products are recycled as animal and plant feed on the remote estate on which it lies. The farm distillery was designed by the late distilling consultant Jim Swan to produce a light, fruity and estery spirit, a character intensified by slow mashes, long fermentations, horizontal lyne arms and shell and tube condensers, with a high, narrow spirit cut. Experimentation comes in the form of varying yeast strains not usually adopted by distillers, while the wood programme will be focused predominantly on ex-Bourbon and red wine cask maturation, with a small Sherry influence. Two dunnage warehouses, located on the hill behind the distillery, feature temperature regulators to allow Ncn’ean greater control over the flavour generated in cask over time. 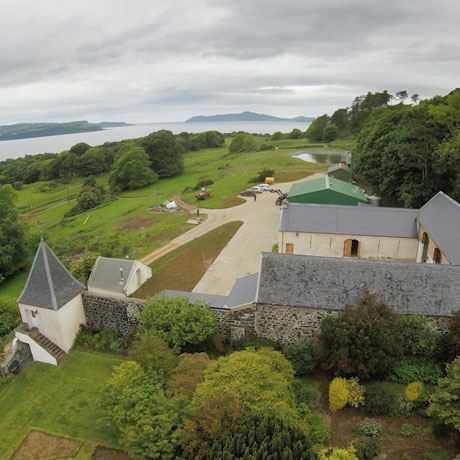 The idea to build a distillery on the grounds of the historic Drimnin Estate came to the Lewis family in 2012, some 10 years after they bought and set about restoring the neglected property. The estate itself had once been Maclean clan territory, and formed part of the Drimnin Castle grounds, but was sold by a bankrupt Charles Maclean in the late 18th century. Following a succession of owners and misfortunes – Drimnin House itself burned down in 1849, its owners meeting unrelated yet tragic and untimely deaths – the estate was rebuilt and eventually restored into holiday lets, a cattle farm and conservation area. By 2013 the Lewis family’s plans to build a distillery in the historic farm buildings adjacent to Drimnin House were well underway, with daughter Annabel Thomas leaving a job in London to manage the project personally as CEO of the newly established Drimnin Distillery Ltd. Following two investment rounds, which included a government grant, the project was finally completed in March 2017. While Drimnin distillery became the working title for the project, the family and its private investors were keen to separate the business from the rest of the estate. At the start of 2017 the new name Ncn’ean was chosen – Drimnin Distillery Ltd will soon also be renamed Ncn’ean Distillery Ltd – and on 21 March the first spirit was filled into cask. The distillery officially opened to visitors in July. The first whisky to be released by Ncn’ean distillery is expected in 2020, although a limited number of individual casks are made available to purchase annually.